Stand Energy has been a leader in the natural gas industry since its deregulation in 1984. Stand Energy can help you navigate the complex electricity markets so you get the best value. Large and small customers alike rely on Stand Energy’s expertise in all areas of energy procurement. Stand Energy is the proud contracted provider of natural gas for multiple healthcare facilities and hospital associations. Are You Getting the Best Deal Possible on Your Purchased Energy? Let Stand Energy Corporation help you manage your commodity purchasing. Stand Energy has constructed Natural Gas pipelines to supply customers not available through the local utility. Last year Gazprom, Russia’s state-owned natural gas company, provided some 40 percent of Europe’s gas needs. Gazprom produced 16.6 trillion cubic feet of gas. 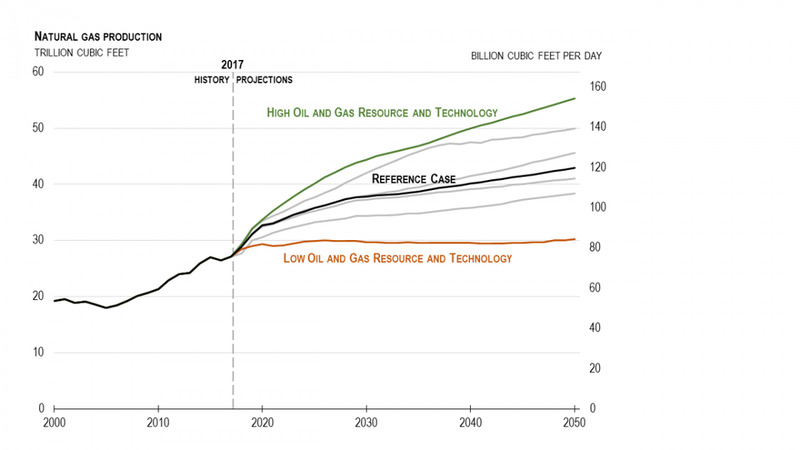 By comparison, America produced almost 27 trillion cubic feet of natural gas in 2017 and, according to the U.S. Energy Information Administration, is on track to produce 43 trillion cubic feet of natural gas by 2050. This rising surge of natural gas production in the U.S. is a good thing for our economy, our energy independence, and the national security of our European allies looking to rely less on Russian production. In the past decade, pipeline and storage infrastructure acted to limit U.S. natural gas production, as supply outstripped demand in some regions, keeping prices low. But, infrastructure has gradually improved and the advent of liquefied natural gas (LNG) export terminals have significantly enhanced the market for U.S. natural gas producers. There were no LNG export terminals in the U.S. prior to 2016. In fact, America’s first LNG export terminal, Cheniere Energy’s Sabine Pass facility in Louisiana, was originally built as an LNG import terminal in 2008 when experts thought the U.S. was facing a severe national gas shortage. Fracking changed all that, with the price of natural gas at the Henry Hub declining 70 percent in inflation adjusted terms from 2008 to 2017. Less than 10 years after fearing America would need dozens of LNG import terminals to meet its energy needs, America instead became a net natural gas exporter in 2017, with exports quadrupling from 0.5 billion cubic feet of gas per day in 2016 to 1.94 billion cubic feet per day. Of U.S. LNG exports last year, 53 percent went to Mexico, South Korea and China, with the largest share, 20 percent, being received by Mexico. Now U.S. LNG exports are set to quintuple by 2019 from 2017 levels to 9.6 billion cubic feet per day or 3.5 trillion cubic feet per year with the U.S. on track to become the world’s third-largest natural gas exporter by 2020, behind only Australia and Qatar. By comparison, 9.6 billion cubic feet is about one-third of what the U.S. uses to generate electricity on an average day and about equal to residential gas use for heating. The value of U.S. LNG exports will be almost $5 billion this year, likely more than doubling to $12 billion in 2019, or about 2 percent of 2017’s trade deficit of $566 billion. A growing share of American LNG exports are expected to go to Europe as EU member states look to diversify from their growing dependence on Russian gas. NATO members Poland and Lithuania in particular have built LNG import terminals to offset their reliance on Russian fuel amidst ongoing unease over Russia’s return to territorially expansionist policies. By making Europe less vulnerable to Russian energy extortion, European policymakers can more confidently confront Russian attempts to destabilize nations on their periphery that used to be part of the old Soviet Union, such as the Baltic States, or bound to the Soviet Union during the Cold War as Warsaw Pact nations, such as Poland. As U.S. natural gas production continues to expand, and with it, exports, there are two key related domestic considerations: growing demand for natural gas to generate electricity, and demand for natural gas as feedstock for chemical and fertilizer production. In 2018, natural gas is expected to generate 34 percent of U.S. electricity, up from 30 percent in 2012. Coal is projected to provide 29 percent of domestic electricity production this year, down from 37 percent six years earlier. Renewables will kick in 17 percent of U.S. power production, with the plurality of that power coming from hydroelectric dams. However, ongoing coal generating station retirements will likely boost natural gas’ importance in reliably powering the grid when wind and solar aren’t generating. And, since fuel costs constitute about 40 percent of the cost of generating electricity with natural gas, any price increase in natural gas will quickly be transferred to the consumer. Further, as some states, such as California, continue to push coal off the grid while promoting wind and solar power, keeping natural gas prices stable becomes crucial in keeping electric prices affordable. It is instructive to note that as natural gas prices dipped 70 percent in real terms from 2008 to 2017, California’s inflation adjusted electricity prices rose by 13 percent as the state invested heavily in wind, solar, and natural gas generating stations. Should natural gas prices rise significantly, California utilities and regulators will have little choice but to pass significant costs onto California residents and businesses. In states that have maintained a robust coal generating capacity, however, consumers benefit from a more diverse fuel mix, with utilities using more coal when natural gas prices are high. As a matter of national policy, investment in new, cleaner and more efficient coal generating stations should not be discouraged as domestic use of coal for electric power serves to keep electricity affordable while encouraging more LNG exports to our trading partners and allies, a win-win for our economy and national security. Check out our Customer Service page to make any changes to your existing account. Stand Energy Corporation has a staff of experienced energy professionals who can help you with all of your energy issues. Are you looking for a more competitive price for your energy? We can give you a quote! Are you an entrepreneur who enjoys commission based sales? We are looking for great sales representatives. No prior energy sales experience necessary.